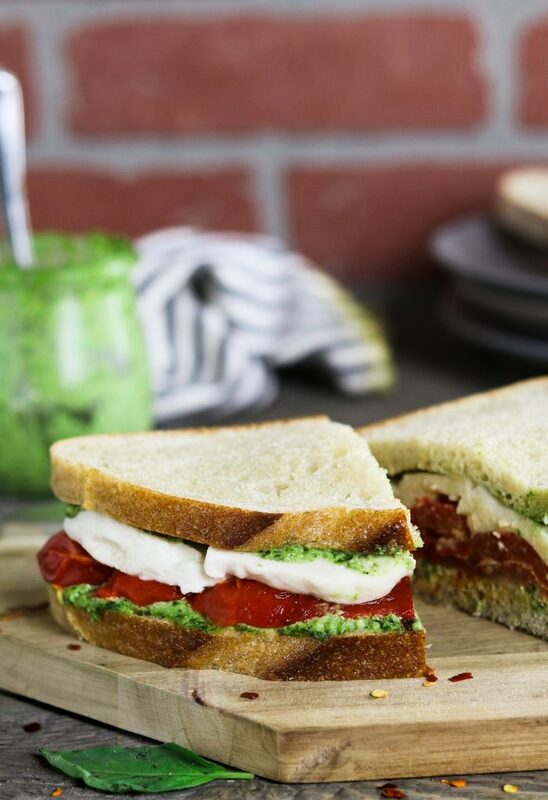 This Roasted Red Pepper Sandwich is built with three layers of deliciousness…creamy vegan mozzarella, cheesy pesto & smoky-sweet peppers. I’m not sure if you guys notice a little trend here, but I’ve been posting lots of recipes with bell peppers lately. My garden is lush with these colorful gems, and I need to put them to good use. No complaints, here because bell peppers are my favorite vegetable (well one of my favorites). So, I’ve been making Roasted Pepper Salad these Quinoa Stuffed Peppers and this Roasted Red Pepper Sandwich. I grew up on Long Island, where there’s literally a deli on every street corner, and this is the sandwich I would order Every. Single. Time. 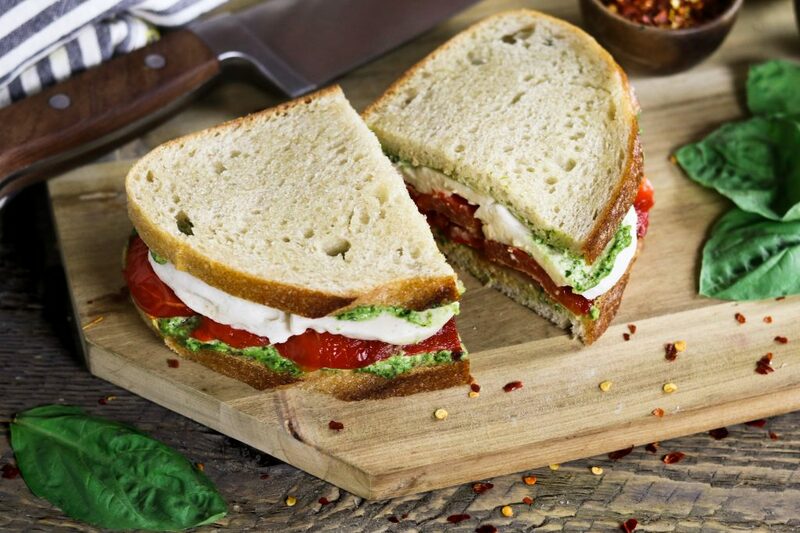 I loved the combination of sweet and smoky flavors from the roasted peppers, coupled with zesty pesto and creamy mozzarella, in between fresh crusty bread. After going vegan, I never dreamed it would be possible to enjoy this tasty sandwich again, but I was wrong. I’m enjoying it even more with this vegan mozzarella cheese and this delicious zucchini pesto. Dreams really do come true! Trust me, this roasted red pepper sandwich is worth the extra effort. It’s not only bursting with incredible flavor, but it’s also hearty and healthy. Once you make the vegan mozzarella, pesto and roast the peppers, you can store it all in the fridge, and have this fancy looking sangy in minutes. It holds up nicely too, so you can bring one to work every day. Your coworkers will be jealous! If you don’t have time to make the mozzarella, you can buy your favorite store-bought variety. You can even buy jarred roasted peppers, but I highly recommend roasting them at home if you can. I haven’t found a vegan pesto, but it’s so easy to make homemade, that it’s almost silly to buy. If you aren’t a pesto fan, just sprinkle the bell peppers with garlic powder, drizzle them with olive oil and balsamic glaze. It’s just as tasty! If you make this Roasted Red Pepper Sandwich, I’d love to hear what you think. It would really make my day. You can also follow me on Instagram and share your creation with me. Just tag me @veganhuggs and hashtag #veganhuggs so I don’t miss it. 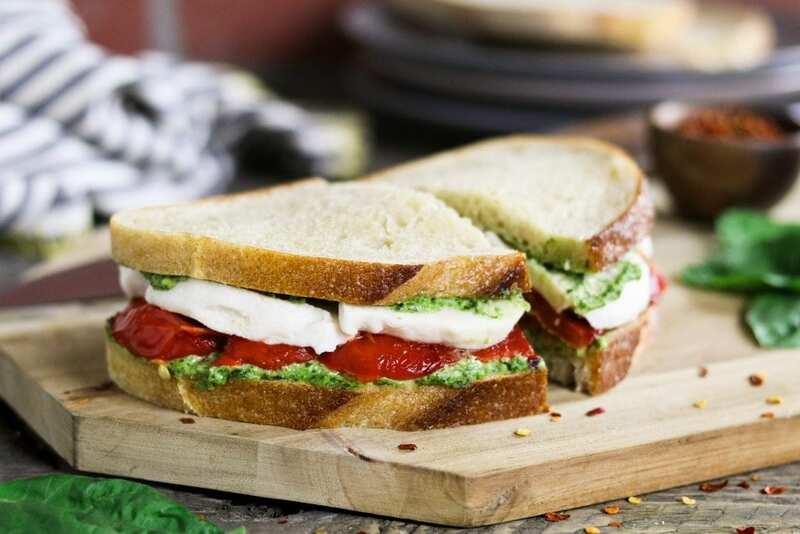 This Roasted Red Pepper Sandwich is built with three layers of deliciousness...creamy vegan mozzarella, cheesy pesto & smoky-sweet peppers. Position oven rack to the highest position and turn on the broiler. Line a baking sheet with foil. Place whole peppers on the sheet about 2 inches apart. Broil in the oven until skin starts to blister and blacken. Using tongs, rotate peppers a quarter turn until all sides are charred, about 3-5 minutes each side. The peppers should be slightly collapsed and soft. The whole process should take about 15-20 minutes. Remove from the oven and place peppers on a cutting board. Cover peppers with a large bowl or pot to steam them, about 10-15 minutes. When peppers are cool enough to handle, slice them vertically, and spread them open to make a long strip. Remove the stem and seeds. Flip the pepper over and remove charred skin. It should peel off easily. Cut peppers into 3/4-inch strips and sprinkle with salt & pepper. Set aside. 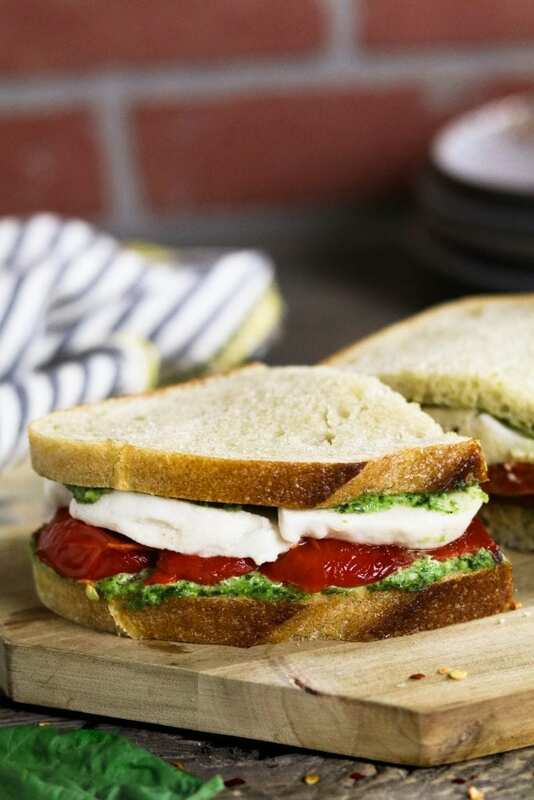 Spread about 2-3 teaspoons of pesto onto the 8 slices of bread. Divide the pepper strips onto 4 slices of bread, then top with the mozzarella slices. Close sandwiches and cut diagonal. Serve and enjoy! * You can make this sandwich with jarred roasted peppers, but the flavor won't be the same as fresh roasted peppers. Still delicious though. * If you aren't a fan of pesto, you can sprinkle the peppers with garlic powder, then brush the bread with olive oil and drizzle with balsamic glaze. * This recipe yields about 4-5 sandwiches, depending on the size of your bread. * I love leftovers, so I usually roast a few extra bell peppers. They will keep in the fridge for 3-4 days. I usually have leftover pesto and mozzarella cheese, so the peppers will come in handy for more tasty sandwiches. * Prep/cook time doesn't include the mozzarella & pesto recipe.